OZ ATV :: The Australian ATV Forum :: View topic - is lancelin closing?? Posted: Thu Nov 15, 2007 11:25 am Post subject: is lancelin closing?? 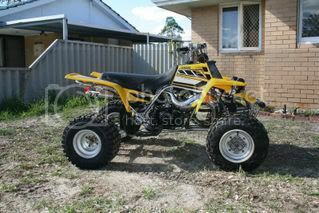 hey people i heard thaqt the guy from last weekend that came of his quad while dinkieng someone in lancelin has died? does anyone know if this is true someone from work told me but they may be confused with the 2 wheeler guy that died im not sure but was also told its now closed. guys please help to find out if its true or not, many thanks. im not sure as i was riding in lano last weekend and i helped the guy into the ambo, he didnt seem like he was gonna die. the lady answering the phone there never even heard of Lancelin !!!! Anyways she put me through to someone else who said the application for temporary closure was sitting on Liliana Ravlich's desk waiting for a signature. Until she does that, Lancelin is open.... if she does it tomorrow, its closed. I am writing this email regarding the Lancelin Off Road Riding Area. I am of the understanding that you are considering a proposal to close this area to the public. If you have the time I would like to introduce myself, voice my concerns regarding the closure of this area, and suggest an alternative to closure. My name is Jason Cowie I am 36, married and have a young daughter. I am ............... and a West Australian who has recently ........ back home. I'm also a long time All Terrain Vehicle (ATV) enthusiast. Consequently I am not in favour of the closure of the Lancelin Off Road Riding Area and I know that I am not alone. The popularity of ATV riding in WA over the last couple of years has exploded. With the recent good economy, cheap ATV imports and the increase of population. There has been a substantial increase of ATV riders out there and accordingly there has been more reported accidents. Unfortunately for users such as myself the first reaction from authorities, I suspect through the fear of litigation, is to wash their hands of the whole situation and prevent access to suitable riding areas. ATV riding/ Quad riding/ or Off Road motorbike riding is a much maligned but exciting, healthy, and "clean" outdoor sport suitable for all ages. Specifically, riding ATVs in sand dunes is an experience I would liken to surfing, skiing, or skydiving. It concerns me that many detractors of the sport have not been fortunate enough to experience riding in sand dunes, especially in an area so suited to it such as Lancelin, I know of only three such areas in Australia. I invite you to join me one fine day on the sand to experience it for yourself. In a controlled environment, ATV riding is a relatively safe sport. I know this because I have been doing it now for 22 years. Unfortunately up to this point ATV use have been largely unmanaged in WA. Do people ride registered ATVs? Do they wear helmets? Do they know how to ride their ATVs? Are they riding an ATV suitable for their experience and or age? Do they ride in areas they are not supposed to? Are there areas for them to ride? Do they speed in areas not safe to do so? None of these questions have been addressed in the past and as a result people have been hurt. By addressing these issues I firmly believe that ATV injuries can be substantially reduced in WA without marginalizing ATV users. Closing riding areas is not the solution to ATV injuries, all it does is send the sport underground. So what are the alternatives? In an attempt to address this issue the Gin Gin shire council has been pro-active by providing a small track for off road vehicle users south of Lancelin and they should be commended for this. It is a well managed facility but it pales in comparison to Lancelin. In no way, shape, or form does it provide an adequate replacement for the sand dune complex. It concerns me that it may be considered a viable alternative. The fact it is open suggests to me a misunderstanding of what the Lancelin Off Road Area is to ATV users. Has an accurate account of users been conducted? In NSW the ownership of the Stockton sand dunes was handed over to the Worimi Community. When that happened every group was consulted except for the ATV fraternity. I have ridden in NSW on many occasions and ATV users were the most prolific, yet at the same time the most under represented. I am concerned that this has also occurred in WA. I have another proposal for the Dunes in question. Consider this if you will. Look at the Lancelin Off Road Riding Area in the same way that you would look at a ski resort. Instead of snow you have sand. Instead of lift passes you have entry fees. Is snow skiing potentially dangerous? off course it is! do we close ski resorts because of that? No we don't. Do ski resorts generate money and tourism? of course they do and lots of it. ................... I believe that with a well thought out and executed plan the Lancelin Off Road Riding Area could be seen as a asset to the community rather than the burden the council perceives it to be now. In conclusion, There is an abundance of ATV users in WA who are traditionally under represented when riding areas are closed. ATV riding is a relatively safe sport that has seen a sudden increase of popularity and been poorly managed which has resulted in an escalation of accidents causing injury. Through fear of litigation more effort has been put towards closing riding areas rather than managing them. Closure of ATV riding areas will not make the problem go away, potentially the reverse is true. On behalf of all ATV users in WA I ask you to not to close the Lancelin Off road Riding area, instead turn a potentially negative situation into a positive one by driving a plan to manage off road vehicles in WA. thats excellent bro i hope it will help, id like to say thankyou very much for standing up for us and doing something about it. clap clap clap. You should go for mayor or something with those speaches. hope it gets u somewhere. "Nothing worth having is easy to get"
hope to see as many people as possible. The popular Lancelin dunes area will remain open, thanks to a decision by the Minister for Local Government, the Hon Ljiljanna Ravlich MLC. The Minister considered the Gingin Shire's request for temporary closure and did not support the request. As such there is no intention to change the current status of the Lancelin Off-Road Vehicle Permitted Area. This is a triumph for common sense and a practical approach to the issues facing Lancelin. RTRA had been arguing that closure was not necessary to undertake a management plan for the area, and we will now endeavour to work with Gingin Council to develop a plan that will improve safety in the area and address the concerns of local residents in relation to noise and illegal street riding. Thanks to everyone who signed our online petition. You can read the comments received here (PDF). We have removed names and email addresses for privacy reasons. To improve safety and to reduce the Shire's liability exposure at this popular facility. Liaise with Gingin Shire to understand the issues. Develop a proposal for development of a Risk Management plan that will satisfy the Shire and its insurers. Work with Gingin Shire and other stakeholders to find a sustainable solution that will enable this area to remain open for riders. Gingin Shire's request to temporarily close the area has not been endorsed by the Minister. Lancelin will remain open! RTRA has offered to assist in the development of a Management Plan for the area. Any riders who use this area are strongly encouraged to register with RTRA so that we can develop a strong user community for this area. December 5: We have received notification that Lancelin will remain open. From the Coordinator of the Government's Off Road Vehicle Advisory Committee: "The Hon. Ljiljanna Ravlich MLC, Minister for Local Government, has advised that she has considered the Shire of Gingin's request and does not support a temporary closure. As such, there is no intention to change the current status of the Lancelin Off-road Vehicle Permitted Area." November 30: 165 names and comments were received to our online petition and were forwarded to Ljiljanna Ravlich MLC, Minister for Local Government and Regional Development. November 20: RTRA has provided Lancelin's insurer's with concept warning signage that can be used as an interim measure while a full Risk Management and Management Plan is developed. November 8: The Government's Off Road Vehicle Advisory Committee has met to consider Gingin Shire's request to close Lancelin. They will be making a recommendation to the Minister for Local Government, Lilliana Ravlich. Nothing can happen until the Minister receives and considers the advice from this Committee. Would expect that it's still a few weeks before any decisions are announced. Meanwhile the Lancelin area is still open. November 6: As part of our behind-the-scenes work to keep the Lancelin area open, RTRA has commissioned some signage concepts to propose to Gingin Shire. We are currently seeking feedback on these and will then put them forward to Gingin Shire as an interim measure to protect the Shire from future liability claims while a detailed Management Plan for the area is done. October 31: Court decision reported in The West Australian - triggers comment and talkback on 6PR and the lead item on the Channel 9 News. October 17: The decision in the case that triggered Gingin Shire's move to close the Lancelin ORV area has been handed down. Judge Keen found Gingin Shire partially liable for the accident, primarily due to the lack of adequate warning signage about the inherent dangers of the areas, particularly the unpredictable drop-offs that can occur through wind action on the dunes. Importantly, Judge Keen did not find that Gingin Shire should have regularly inspected the dunes, or identify particular dunes that were especially hazardous, or place signs around the dunes to warn of specific dangers or exclude the public from the area. On the last point, Judge Keen said it is "probably safer to have these activities being carried on in a specific area rather than being conducted by members of the public on an ad hoc basis". This judgement strongly supports the RTRA view that Gingin Shire can obtain the protection from lawsuit that it needs simply by ensuring that there is more adequate signage, and without needing to close the area. RTRA has again written to the Shire CEO voicing opposition to the proposed closure. A submission will also be made to the Off Road Vehicle Advisory Committee which is currently assessing Gingin Shire's request. September 28: The Off-Road Vehicle Advisory Committee met on September 28 to consider the Gingin Shire's request to temporarily close the Lancelin Off Road Vehicle area. We will notify members of the outcome of this meeting as soon as we are able to. September 6: The court case which triggered Gingin Shire to move to close the Lancelin ORV Area has now concluded (August 24), with the Judge reserving his decision. This means the outcome may not be known for several more weeks. Among options being considered by Gingin Shire is to officially close the area and only open it for part of one day every month. RTRA President Steve Pretzel met with the Gingin Shire CEO on August 27 to request a 6 month moratorium on any closure of the Lancelin ORV area. This would provide sufficient time to explore improved management options for the area and to consider the implications of the State Trail Bike Strategy. The CEO agreed to take the request to council later this month. It is most likely that the ORV facility will remain open pending a decision from the council. That is brilliant news........ ! I think Liliana has just made thousands of new friends ! Great work guys. A victory for all atv riders. Thats great stuff everyone. soon as i can ride again im out there..